CHICAGO (CBS/AP) - An eye-opening study says delaying high school starting times by just 30 minutes can reap big rewards for tired teens. A small study at St. George's School in Middletown, Rhode Island, says students there were more alert in class, expressed better moods, arrived to class on time, and even reported eating a healthier breakfast due to the later start. "The results were stunning. There's no other word to use," says Patricia Moss, academic dean at the boarding school where the study was done. Similar results have been found in some public schools that let teens start school late. Researchers say there's a reason why even 30 minutes can make a big difference. Teens tend to be in their deepest sleep around dawn - when they typically need to get up for school. Interrupting that sleep can leave them groggy, especially since they also tend to have trouble falling asleep before 11 p.m. According to Brown University sleep researcher Dr. Judith Owens, "There's biological science to this that I think provides compelling evidence as to why this makes sense." Owens is a pediatrician at Hasbro Children's Hospital in Providence, R.I. and the lead author for the sleep study. Overall, 201 high school students completed sleep habit surveys before and after the nine-week experiment last year. The results were so impressive that the school made the change permanent, Moss said. Class starting times at the boarding school were shifted from 8 to 8:30 and 5 to 10 minutes were dropped from each class to ensure the school day would finish on time and guarantee extracurricular activities were not affected. Moss insists that the lost time was worth it because the students were so alert and productive during the day. Among the results: The portion of students reporting at least eight hours of sleep on school nights jumped from about 16 percent to almost 55 percent; reports of daytime sleepiness dropped substantially, from 49 percent to 20 percent; first period tardiness dropped by almost half and students reported having more time to eat a hot, more nutritious breakfast. Moss believed the healthy breakfast was a strong contributor in the increased alertness throughout the mornings. While many parents and teachers at St. George's School were initially opposed to the idea of a later start timl, they reluctantly agreed to the study after a presentation by Owens, whose daughter was a junior at the school. Recent graduate and study participant, Garrett Sider, 18, has nothing but praise for the later start time, noticing that students participated more actively in morning classes with the later start. "It was a positive thing for the entire school," he says. The study was designed to look at changes in sleep habits and behavior and didn't examine academic performance. It also lacked a control group of students who didn't experience a change in school start times - another limitation. 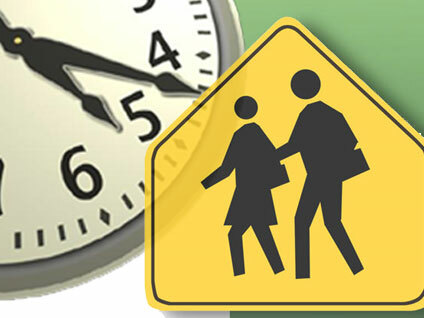 Still, the researchers said the results show delaying school starting times is worthwhile. The results of the study appears in July's Archives of Pediatrics & Adolescent Medicine.